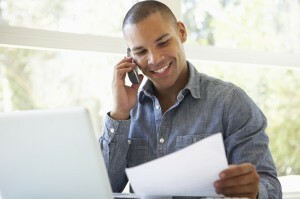 E-Complish > Resource Center > Blogs > What Is IVR Credit Card Processing? Interactive Voice Response (IVR) is the technology by which a computer interacts with a human. Specifically over the phone, people receive voice prompts and responses from the computer as they press telephone keypads that send DTMF tones back to the computer. IVRs are also capable of speech recognition programs that allow people to communicate verbally with the computer in a way that solicits a response. It can integrate different collection-specific tools, including automated revenue processing, payment exception management and mobile-friendly payment options. It can also be used to handle both inbound payments and outbound notifications. Basically, an IVR is the computer you talk to when you call your utility company to pay your electric bill. Most often used to handle high call volumes, IVRs provide businesses with a system by which customers can get their questions answered automatically. They can either listen to pre-recorded responses or dynamically generated audio that helps the customer reach his/her goal. The system can streamline nearly every business function that can be broken down into a series of simple interactions, such as making payments over the phone or getting your account balance. • Save Time: There are a number of business functions that are almost exactly the same every time they occurs. For example, if a customer wants to know when you are open, the answer to that question is the same every time. It is a smarter use of resources to give them pre-recorded information instead of passing the same question to employees over and over. Not only does this save the time of your employees, but it saves time for your customer’s. They get the answer they want immediately and with no fuss. The same is true for collecting payments. • Save Money: Why pay a customer service rep $10 an hour to do the job a computer could do for $1. The energy of your service team is better spent actually answering the questions that require human interaction. On a very basic level, an IVR saves on the cost of answering customer calls. But it also allows you to take better care of your employees who would much rather be solving actual problems than just taking payments. Happier employees equals lower turnover which means money saved. The process of creating a pathway for an IVR systems to follow in order to collect payments has become increasingly sophisticated. As various payment collection types are developed (check, multiple credit card types, ACH, etc.) these pathways must accommodate consumer demand. In order to take proper care of your customers, an IVR pathway must be thoroughly researched, taking into account the details of your customer base and their needs. Otherwise, what is meant to be a customer service tool become an inhibitor to their satisfaction. For example, not every customer knows where a security code can be found on a card. So if you are accepting credit card payments, you will most likely need to explain where the code is. However, it is in the same place for every card except American Express. So when crafting the pathway, it is important to account for the difference in how the computer will describe the location of the security code depending on what card your customer is using. IVRs are powerful tools that can make a significant difference in how businesses operate and how they interact with their customer base. When used correctly, it can revolutionize the way a business handles customer service calls, collects payments, and boosts the satisfaction of their employees.